On Thursday, September 17, a large group of students and professors crammed into the Robert Ho Lecture Room in Lawrence Hall as Assistant Professor of History Tsega Etefa continued a mini lecture series, titled "Reflections of Ethiopian Orthodoxy." Specifically, Etefa, a native of Ethiopia, spoke on "The Origin and Expansion of Orthodox Christianity in Ethiopia." The talk, which was one of several campus wide events that has contributed to Colgate's inaugural Diversity Week, was well received by students and professors alike. "It was interesting to hear such an informative talk about something that is completely foreign to many of us here at Colgate," junior Mike Naughton said. "It was also an incredible experience to hear Professor Etefa talk about an issue that he has had personal experience with." The talk focused on the longtime presence of Orthodox Christianity in the East African nation. Etefa explained that Christianity originally came to Ethiopia as early as the 4th century CE. 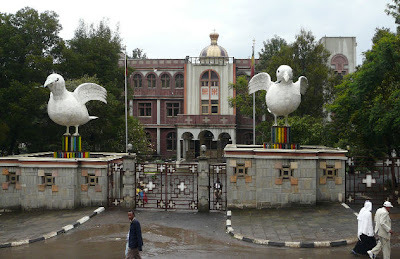 According to the legend, the church was established when two Christians named Frumentios and Aidesios were kidnapped on the Red Sea and taken to Aksum, Ethiopia's capital at the time. Because the two boys were educated, they were soon installed as private tutors to the royal family. It was at this point that the boys taught the king's children the fundamentals of the Christian faith. Throughout the next century, the religion gradually spread through traditionally pagan areas. Largely because of the arrival of the "Nine Saints," a group of men who traveled from Asia Minor and translated the Bible into the local language, the spread of the religion was extensive. While the early arrival of Christianity is noteworthy, the ability of the religion to maintain itself in a region of the world that has largely been marked by the presence of Islamic and Pagan beliefs, shocked many students. "It was pretty surprising to hear that Christianity has existed in that area of the world for so long," senior Alex Gardner said. "The first religion that comes to mind in that region is usually Islam. Professor Etefa proved that wasn't the case at all." After tracing the presence of the religion throughout the nation's history, the talk concluded with a discussion of Orthodox Christianity's current role in Ethiopia. Within Ethiopia's current population of 68 million, over 58 percent adhere to Christian beliefs, with over 40 percent practicing Christian orthodoxy. A reception in the Longyear Museum of Anthropology directly followed the talk. On display in the Museum was an array of highly ornamental Ethiopian religious objects of personal devotion. First, I greet you by saying Happy Ethiopian New year (Enqutatash). Please find attached an ARTICLE which would be of interest to fellow Ethiopians. I will be most obliged if you can post it on your website. ስምዐ ጽድቅ፡- በቅርቡ በቤተ ክርስቲያን አካባቢ በተከሰተው ችግር ማኅበረ ቅዱሳን ምን አቋም አለው? 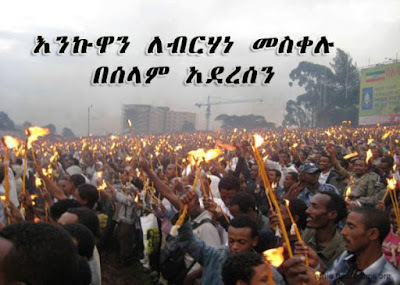 የብፁዓን አባቶችን የመደብደብ ሙከራ አስመልክቶ ምን ይላል? በአጠቃላይ በችግሩ ዙሪያ ያለው አቋም ምንድነው? ስምዐ ጽድቅ፡- የፖለቲካ አቋምን በተመለከተስ? ስምዐ ጽድቅ፡- ማኅበረ ቅዱሳን ከኢትዮጵያ ኦርቶዶክስ ተዋሕዶ ቤተ ክርስቲያን የሰንበት ት/ቤቶች ማደራጃ መምሪያ ጋር ያለው ግንኙነት የሻከረ ነው፤ ማኅበሩም ለመምሪያው ለመታዘዝ ፈቃደኛ አይደለም የሚሉ አስተያየቶችም አሉ፡፡ እርስዎ እንደ ሰብሳቢ ምን ይላሉ? ስምዐ ጽድቅ፡- የመምሪያው ዋነኛ ጥያቄ የማኅበሩን ገንዘብና ንብረት ኦዲት በመደረጉ ጉዳይ ነው፡፡ ማኅበሩ በዚህ ላይ ያለው አቋም ምን ስልሆነ ነው ችግሮች የተፈጠሩት? በጣም ያስደነገጠኝ በቅዱስነታቸው የተነበበው መግለጫ አይሉት ማዘዣ ነው።ለመሆኑ ይህ ሽፍጥ ከተዘፈቁበት ውጣ ውረድ ፋታ ያሰጠኛል ብለው ይሆን ? ማህበሩ የፖለቲካ አዝማሚያ ስላሉት ጉዳይ ለሚነሳው ጥያቄ መልስ የምንፈልገው ከፓትርያርካችን ሳይሆን ከዘመኑ ተዋናይ ከአባ ሠረቀ ነው። ለመሆኑ የየትኛው የፖለቲካ ድርጅት ደጋፊ ነው? 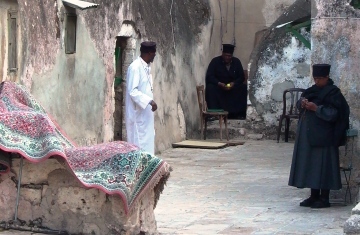 Above photo: Ethiopian monks on the roof of Christianity’s holiest shrine in Jerusalem (Creative Commons Attribution). New York (Tadias) - The following piece was first published on the print issue of Tadias Magazine in the context of the July 2002 brawl that erupted on the roof of Christianity’s most holy place between Ethiopian and Egyptian monks. (Click HERE to view in Youtube). በርግጥ በዚህ ሁሉ ነገር መንግሥትስ ቢሆን “ፖለቲካዬን ይጠቅመዋል” ብሎ ያስባል ማለት ነው? መንግሥት ከሚጠላባቸው ነገሮች አንዱ ፓትርያርክ ጳውሎስና የተበላሸ ማንነታቸው መሆኑን አልተረዳም? እርሳቸውን ማስተካከል ከሕዝብ መታረቅ መሆኑንስ አልተገነዘበም? ፓትርያርኩ መንግሥት ላይ ኪሳራ ከማምጣታቸው በስተቀር በረዥም ጊዜ ካየነው ጥቅማቸው እዚህ ግባ የሚባል አይደለም። ቤተ ክርስቲያኒቱ ግን ትልቅ ስብራት እየገጠማት ነው። ከዚህ ስብራቷ ለማገገም የአንድ ትውልድ ዕድሜ ሊጠይቅ ይችላል። ምንኩስና ተበላሽቷል፣ ክህነት ረክሷል፣ ጵጵስና ክብር አጥቷል፣ ሊቃውንቱ የትም ወድቀዋል፣ አባቶች ሳይሆኑ ደንደሳም ወይዘሮዎች ቤተ ክህነቱን ተቆጣጥረውታል፣ የቤ ክርስቲያን ገንዘብ የማንም መጫወቻ ሆኗል፣ ምእመናን እረኛ አጥተዋል። ለዚህ ሁሉ ዋነኛው ምክንያት ፓትርያርክ ጳውሎስ ናቸው። ለእርሳቸው መከታ ሆኖ ያስጠቃን ደግሞ መንግሥት ነው። ስለዚህ “ይበቃል” እንላለን። እጅህን ከቤተ ክርስቲያን ላይ አንሣ!!!!!!! !